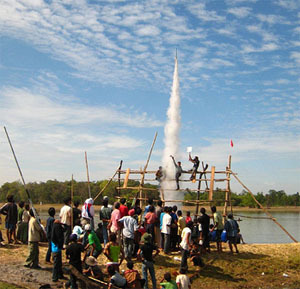 Laos Festivals and Events - Lao New Year, Boat race festival.. 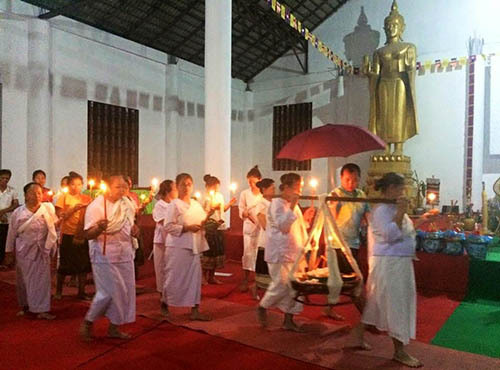 The majority of Laos festivals are based in the Buddhist faith that dominates the country and hold an important religious significance for Lao people, thus festival dates may be flexible as they are tied to the lunar calendar. Boun Pha Vet is a commemoration of the Jataka, the life tale of Prince Vestsantara, the Buddha's penultimate life. The story of Lord Buddha as Prince Vestsantara is recited in temples throughout the country. This is considered a particularly auspicious time for ordination as a monk. There is no fixed date for the festival. 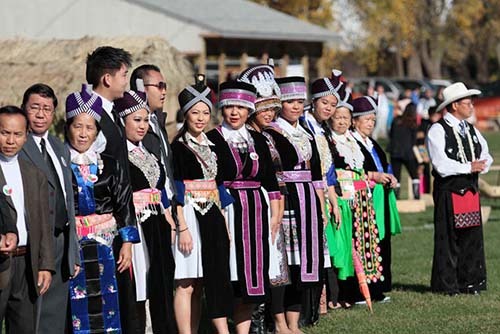 Every village set their own dates, but they coordinate with surrounding villages to avoid collision as families and friends in different villages exchange invitation to join in celebration. 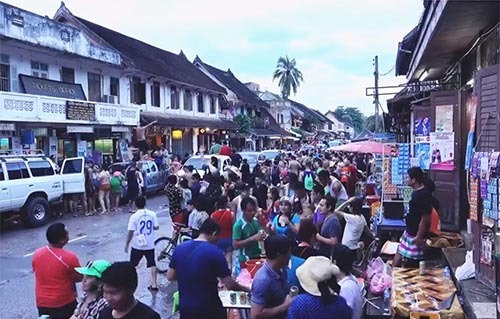 There are many people of Chinese and Vietnamese heritage who live in Laos as well as migrants from these countries, and the New Year celebration is an important time for them. Many businesses are closed for several days during this time. 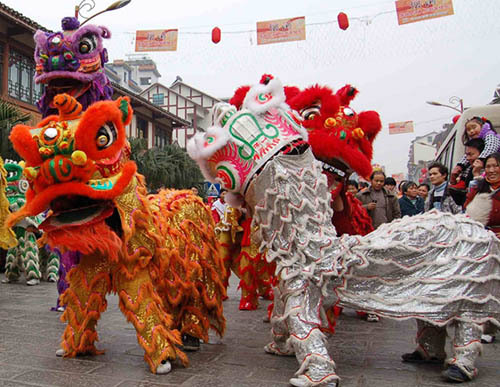 They celebrate with lion dances, fireworks, special foods, visit to temples and merit making. 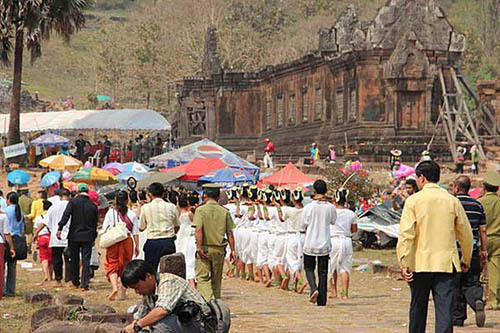 This religious festival is held at the pre-Angkorian Wat Phu site every year in Champassak province, about 10 hours drive south of Vientiane. It is held on the full moon night of the 3rd month of lunar calendar (in 2018 it falls on 31 January, according to my calculation). A trade fair of products from the southern province of Laos, Thailand, Cambodia and Vietnam is also held 3-5 days prior. Wat Phu is the most famous Hindu temple complex built in Laos under the Khmer Empire is one of Laos' world heritage sites. The elephant festival is a two-day celebration organized annually (mid-February) in Xayaboury province. Some 100 elephants and their mahouts from around the area gather to demonstrate working techniques and all things elephantine. 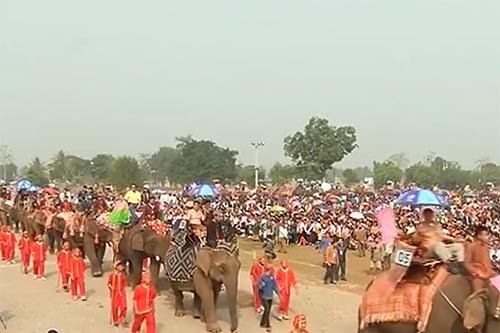 The celebration filled with elephant-related activities such as mahout and elephant shows, elephant procession, monks’ blessings, a traditional elephant Baci ceremony followed by the election of the Elephant of the Year. Visitors can enjoy documentary films on a an outdoor screen or live performances on the main stage. Elephant ride in the nearby forest is also available. This is the biggest festival of the year all around the country. It is partly a religious festival as it is the time Buddha images are cleansed, but is it also an all-out water festival. For three days be prepared to get wet wherever you go as water is thrown on everyone. 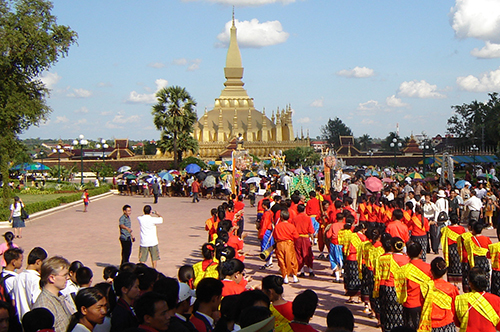 In Luang Prabang there are traditional processions and many other events. In Vientiane Capital, one of the main roads in central area is closed for vehicles and turned to walking street full of young and old celebrating, drinking, dancing and splashing water to passerby. This is the beginning of the three-month long Buddhist Lent. All monks stop travelling and stay at temple for prayer and meditation. It's also time for ordination of men entering a monkhood. In Vientiane and the border town of Nong Khai, Thailand, this is the day that the Naga (mythical water spirit) is supposed to send fireballs into the sky from the Mekong which has become a big attraction for many people who flock to the river banks to try to sight these elusive fireballs. 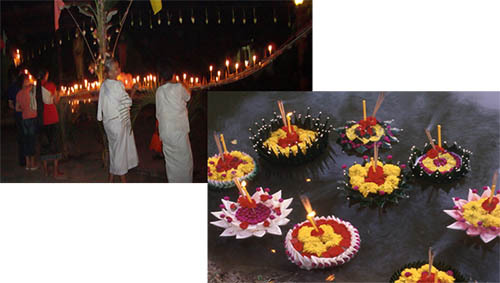 The End of Buddhist Lent festival takes place at every temple around the country though some may omit the floating of the decorative boat on the river as not all communities or villages are located near a river, but all will do the morning almsgiving procession and decorate lighted boat at the temples. In Luang Prabang, it is also significant. On the full moon day, there is early morning alms giving at every temple followed by the That Phousi and Vat Vixoun festivals. In the evening decorated boats will be carried from the centre of Luang Prabang to Wat Xiengthong (Xiengthong temple) where they will be taken down to the river and launched from 7pm to 11pm. 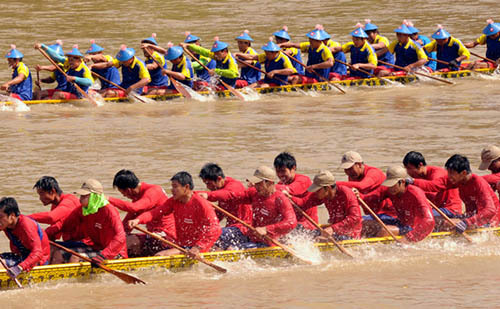 Vientiane boat racing is one of important Laos festivals, it is huge and the town shuts down as food stalls, games and fairs take over the riverfront. Usually a trade fair and concerts are concurrently a organised at Lao-ITECC. There will be free concerts and trade fairs featuring a wide range of domestic and international products at the fair. The concerts will feature local and Thai artists such as Kong Xayavong, Pouky, Monkaen Kaenkhoun and Kong Huayrai.